Supply chain complexity has grown from simple domestic sourcing, manufacturing and distribution, to a complex evolution of global sourcing, manufacturing and distribution centers. Maintaining control of your entire supply chain is monumental and maintaining compliance is absolutely essential. If your organization hasn’t already implemented an automated Supplier Management system, you are undoubtedly feeling overwhelmed. Technology is critical to securing the global supply chain because it is the only way to have visibility into products and assets across the extended supply networks, and the ability to immediately take action. However, current manual processes can limit the integration of applications and data for adequate analysis to effectively understand your state of supply chain quality, compliance, and potential risks. While supply chain data may be maintained within a certain quality system, departments, or other manufacturing and procurement automated solutions, in many cases different elements of an organization’s product supply, quality, regulatory and commercial functions are disconnected. An integrated quality approach needs to be embedded into the core business. How many systems contain some supplier quality data throughout the product lifecycle? How much time is spent navigating the maze of data versus using and focusing on problem solving? How much time is spent on the duplication of data entry or searching for data entry errors across different supplier quality systems? Can people at all points in the chain create data that are recognized from end to end? SCARs – do they signal not only discrete performance issues (e.g., a failed batch), but overall degradation to the whole company? CAPAs – are all sites aware of the issues that affect them and are they actively looking to make connections? Holds – are they instantaneous throughout the entire chain? Nonconformances – does the information get passed along forward and backward? Have you truly leveraged technology to enable effectiveness, efficiency, and closed-loop processes? Although these systems provide automation that helps organizations reap the benefits of repeatability and sustainability, are they truly complementing your overall supplier quality investments? Integration allows real-time access to data stored within each system, enabling your organization to make informed decisions based on current information. But it’s not just about technology and automation. Automation of inefficient processes, by default, will simply make your inefficiencies happen faster. A comprehensive supplier quality management system helps companies understand the significant impact that poor quality, service and delivery has on sales and profits. Take what you’ve learned from your process inefficiencies, and your understanding of best practices, and architect them into an integrated supplier quality platform across your organization value chain. With such technology enablers in place, reporting and analysis becomes easier for management and all stakeholders to understand the supply chain state of risk, quality and compliance. 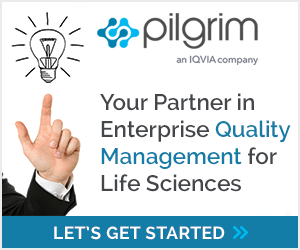 Exploring Pharmaceutical and Medical Device Supplier Quality Management (Part 1 of 4).